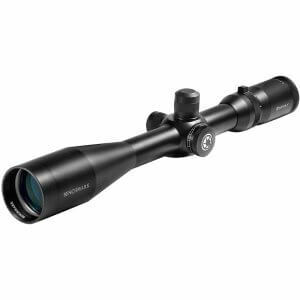 Accuracy, durability and exceptional optical quality are hallmarks of the Benchmark scope series. The Benchmark's Mil-Dot Reticle is on the first focal plane which means that it tracks proportionally throughout the power ranges no matter what power you have the scope on. You can mil, hold over, hold off or do anything that requires an accurate measurement without worrying about the scope's power setting. Available in zoom or fixed power each Benchmark model is waterproof, fogproof and shockproof and features fully multi-coated optics for sharp distortion-free views. Backed by Barska's Limited Lifetime Warranty.